Each year Italy's beautiful countryside is spattered with numerous food festivals that showcase various delectable foods such as garlic, pasta, lentils, fruits, nuts, chocolates and more. 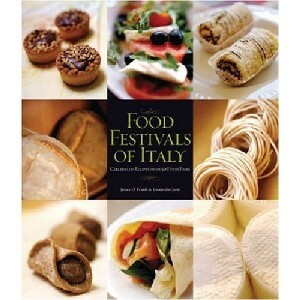 Now "Italian Food Festivals" highlights 50 of Italy's most diverse food fairs, bringing a taste of authentic Italy into your home with 100 recipes featuring festival foods. "Italian Food Festivals" is filled with spectacular photographs and centuries-old recipes that bring the Italian countryside, its people and their cuisine to life for readers. Award-winning authors James O. Fraioli and Leonardo Curti take both professional chefs and home cooks on a culinary odyssey of a different sort, transporting food lovers and travel aficionados to the stall-lined village streets of these local festivals, filling their imaginations with the tempting aromas, the warmth of the Italian sun, the spectacular settings and easy camaraderie of the friendliest hosts in the world.